SMITHFIELD, Va., Sep. 05 /CSRwire/ - The Smithfield Foundation, the philanthropic arm of Smithfield Foods, Inc., is pleased to announce a significant donation to the Food Bank of Central & Eastern North Carolina to support its Wilmington Branch Location, serving Brunswick, Columbus, New Hanover, and Pender counties in southeastern North Carolina. 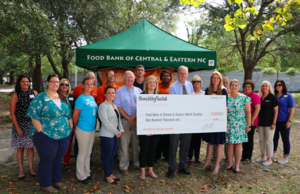 The company presented a $100,000 donation while Smithfield employees volunteered, helping to pack meals for those served by the food bank in the Wilmington community. The Wilmington Branch of the Food Bank of Central & Eastern North Carolina distributed more than 9 million pounds of food in 2017 to those facing hunger in their service area, where more than 70,000 people live in food-insecure households. As a leading consumer packaged goods and protein company, Smithfield’s support aligns with the company’s social purpose to improve food security and alleviate hunger across the country. The event also kicked off Hunger Action Month, a month where people all over America stand together with Feeding America® and the nationwide network of food banks to fight hunger. In addition to this donation, Smithfield Foods is conducting a nationwide employee food drive at their more than 50 facilities and offices to take action on the hunger crisis with local community food banks. Smithfield Foods is a $15 billion global food company and the world's largest pork processor and hog producer. In the United States, the company is also the leader in numerous packaged meats categories with popular brands including SmithfieldⓇ, EckrichⓇ, Nathan's FamousⓇ, FarmlandⓇ, ArmourⓇ, Farmer JohnⓇ, KretschmarⓇ, John MorrellⓇ, Cook'sⓇ, GwaltneyⓇ, CarandoⓇ, MargheritaⓇ, Curly'sⓇ, Healthy OnesⓇ, MorlinyⓇ, KrakusⓇ, and BerlinkiⓇ. Smithfield Foods is committed to providing good food in a responsible way and maintains robust animal care, community involvement, employee safety, environmental and food safety and quality programs. For more information, visit www.smithfieldfoods.com and connect with us on Facebook, Twitter, and LinkedIn. The Food Bank of Central & Eastern North Carolina is a nonprofit organization that has provided food for people at risk of hunger in 34 counties in central and eastern North Carolina for more than 35 years. The Food Bank serves a network of more than 800 partner agencies such as soup kitchens, food pantries, shelters, and programs for children and adults through warehouses in Durham, Greenville, New Bern, Raleigh, the Sandhills (Southern Pines), and Wilmington. In fiscal year 2017-2018, the Food Bank distributed nearly 70 million pounds of food (over half of which was perishable) and non-food essentials through these agencies. Sadly, hunger remains a serious problem in central and eastern North Carolina. In these counties, more than 600,000 people struggle to access nutritious and adequate amounts of food necessary for an active and healthy life. foodbankcenc.org.